In-room mini-fridges free coffee an outdoor pool and easy access to Tijuana Mexico are among the perks our guests find at the budget-friendly EZ 8 Motel South Bay. The three-story EZ 8 is home to 189 rooms all featuring Wi-Fi availability and mini-fridges. Non-smoking rooms can be requested. Guests enjoy free morning coffee a year-round outdoor pool and a hot tub. You'll also find a game room business center and guest laundry on the premises. Pets are allowed for a fee. Parking is free. The EZ 8 is a little over five miles from Tijuana Mexico. It's also five miles from San Diego Country Club and six miles from the San Diego National Wildlife Refuge Complex. Silver Strand State Beach is eight miles away and the Naval Base San Diego is nine miles away. SeaWorld is a 20-mile drive. 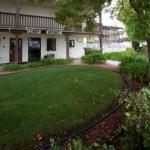 The motel is 15 miles from San Diego International Airport.